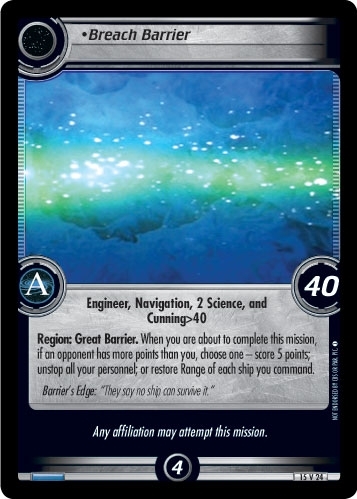 Barrie's Edge: "They say no ship can survive it." Mission located in Alpha-Quadrant with span: 4 and points: 40. Special Instructions: When you are about to complete this mission, if an opponent has more points than you, choose one - score 5 points; unstop all your personnel; or restore Range of each ship you command. Affiliations: Any affiliation may attempt this mission. Characteristics: Great Barrier Region, Mission. "Breach Barrier" is a backward compatible card form the Second Edition expansion The Undiscovered Country - ST1E compatible (by The Continuing Committee). See collectors infos for this card in the Second Edition section under the UCT-ID: ST2E 15 V 24.